Back in January I shared that we had closed more than $25MM in new capital from the Ripple team, with follow-on capital from Allen & Co, Wes Edens, J. Balvin, Fabio Acosta, Vivi Nevo, Founders Fund, Karlie Kloss, Penni Thow, DJ Skee, Shrug.vc, and Dream Machine. 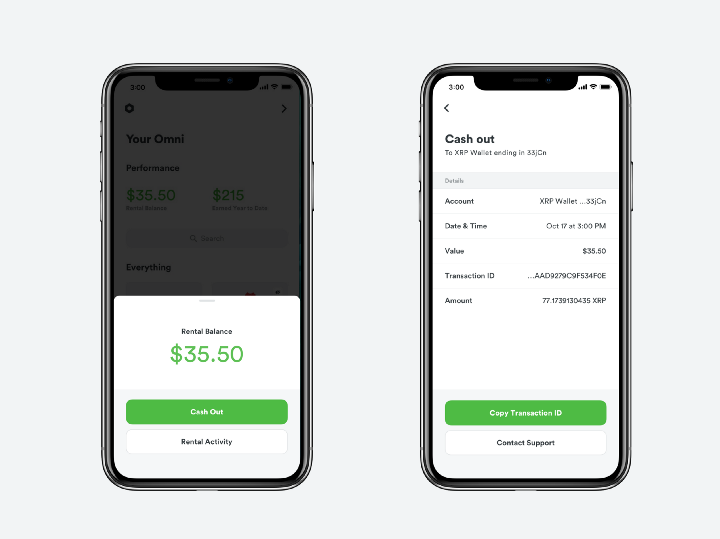 Today I’m very excited to announce that we have integrated XRP into our product so Omni members now have the option to cash out their rental earnings to an XRP wallet. This is especially exciting because this is the first time that consumers can get XRP outside of an exchange. We’re building towards a world with frictionless access to the things we need as we need them, irrespective of ownership. In order to realize this vision, we set out to implement a payments system that was both instantaneous and global, which is why we partnered with Ripple back in January and why we’re excited to announce the XRP cash out option now. By enabling XRP cash outs we’re aiming to lower the barrier to entry for crypto-curious consumers and also reduce the risk because you still own the asset. Ready to give it a try? Rent your things on Omni! When someone rents from you, you’ll earn money that you can then cash out to XRP or USD. While our San Francisco Bay Area and Portland communities have a diverse assortment of rentable items, the most popular ones are currently bikes, folding chairs, folding tables, vacuums/carpet cleaners, tents, and drones. And a little behind the scenes intel — we see the most unfulfilled searches for musical instruments (drums and keyboards) and cameras. Thank you to the XRP community for your patience as we worked to get this right! And to those new to the crypto world, welcome in. We are thrilled to build this future with you.